Welcome to Islands Marine Center, Inc. Experience: A proven track record of success and unparalleled customer service. Founded in 1972 by Ron and Jennifer Meng. We are very proud to be a dealer for Pursuit Boats and Ocean Sport Boats . Knowledgeable Marine Sales Professionals: Our sales team works hard to build long term relationships with our customers. We are boat owners who cruise, fish and test our boats year round, giving us intimate knowledge of Pursuit and Ocean Sport..
A Complete Hands-on Orientation: With your purchase of a new Pursuit or Ocean Sport, you are invited to be our guest for two full days of orientation. We cover all mechanical and electrical systems. 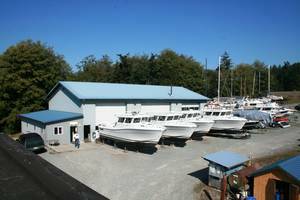 We provide custom training on all of your installed marine electronics, as well as boat handling techniques, preventative maintenance hints, safety and emergency procedures. Factory Authorized Service and Innovative Rigging Team: Our service department is managed and staffed by experienced marine technicians. We service Volvo-Penta Mercruiser, gas/diesel inboards and stern drives as well as Yamaha and Evinrude/Johnson outboard motors. 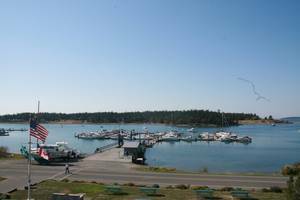 Location: IMC is your homeport in the San Juan Islands. We are located in Fisherman Bay on Lopez Island. 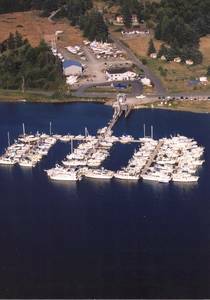 We feature a 100-slip, full-service marina with chandlery, marine and NAPA automotive parts department. We also offer year round storage facilities with 6 acres of dry storage and haul-outs to 25 tons. We are centrally located in some of the best fishing and cruising waters anywhere. A Friendly Staff: Ready to assist you with all of your boating questions and needs. 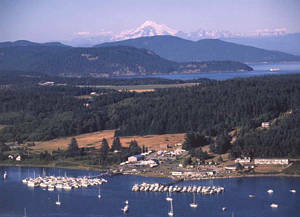 Lopez Island is a long way from many of the easy to access, mainland dealerships. Our inconvenient location demands that we offer a different experience to our customers. Our location demands that we provide our customers with a sales process that goes above and beyond what anyone else in the industry offers. Owners Ron and Jennifer Meng realized this in the very beginning, and what began as their personal business ethics eventually defined and separated Islands Marine Center from other dealerships. It is those very ethics that still serve as the backbone of Islands Marine Center today. The vast majority of our customers are repeat and word-of-mouth referrals – a fact we are proud of and believe is a testament to our thorough and knowledgeable customer service. Ron and Jennifer wanted to offer their customers a boat that fits the unique needs and lifestyles of the Northwest, as well as offer the absolute best in quality. Today, this has led to a line-up of three uniquely Northwest boats that are the top of their class, Ocean Sport Boats and Pursuit Boats. Today, we are dedicated to helping customers find the precise boat that fits their needs. Whether it’s a cruising, fishing or work boat that you are looking for, we are pros at finding what will fit and perform for your unique specifications. We whole-heartedly believe that it is a disservice to sell our customers something they don’t need, while we find it even worse to NOT sell something they do need. While most sales processes end once the paperwork is signed and the money has been paid, that is when ours really begins. For more than 40 years Ron has provided every single new boat customer with a thorough orientation of their vessel. This free, all-inclusive two-day orientation includes everything from lessons in how to use the electronics to docking and piloting instructions and maintenance tips. We give our customers the most complete orientation in the industry and have been doing it since the beginning. We can’t wait for you to join the Islands Marine Center family! Store hours Monday - Saturday 8:30am to 5:00pm (our Service Department is open Tuesday - Saturday 8:30- 5:00). We offer a variety of products for all your boating needs, including Interlux* anti-fouling and bottom paint.